The Santa Clara Players production of the comedy Exit the Body, playing now through Nov. 17, is an evening of old time farce and fun dressed up like an Agatha Christie mystery — a genre the play spoofs. The successful mystery writer Crane Hammond has rented a vacation house set in a remote corner of Vermont. She arrives one hot summer evening with her secretary, Kate, only to discover that stolen jewels are hidden in the house. Hammond is destined to live a mystery as well as write another one while on her writer’s retreat. Throughout the evening, bodies appear and disappear in a closet. Unannounced and sometimes unknown visitors knock on multiple doors — or sneak in and out. And in the wee hours of the morning, the bad guys and the good guys — no one, including the audience, can really be sure who is who — scramble furtively in the dark. They are dead set on finding the missing jewels. Exit the Body director Robert Casillas describes the three-act farce as a true old-fashioned comedy that reflects the black and white TV comedies of the 1940s and 1950s. The seasoned actors have their comedic timing and pacing down pat, even when darting on and off the set in the dark with nothing but a flashlight in search of the jewels in Act III. Diane Thorne, who plays the amnesiac Phyllis, debuts with Santa Clara Players. Show subscribers will recognize the other nine well-cast actors from past productions. Lisa Burton opens the play as the naive and ditzy housekeeper Jenny. She is led astray by the petty crook Randolph, played by Santa Clara native Todd O’Donnell. As a writer in search of solitude, Helena G. Clarkson faints effortlessly with the discovery of each new body. Sandy Sodos, playing the secretary, delivers her lines with droll aplomb. Pat Cross, as the house rental agent Helen O’Toole, is a look-alike for actress Helen Mirren. Laughter, according to received wisdom and scientific study, is said to be the best medicine. Exit the Body is aimed to deliver a strong dose, making you laugh and taking your mind off personal issues and, yes, even November elections — at least for a few hours. “It was entertaining with an unexpected ending. 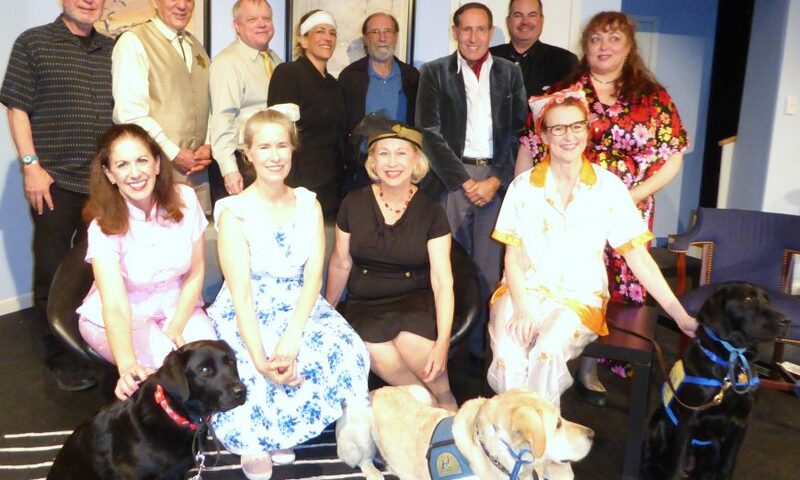 It was a fun night,” said San Jose resident Shari Rodenberger, with two Canine Companions for Independence (CCI) puppies-in-training lying at her feet during dress rehearsal Oct. 25. 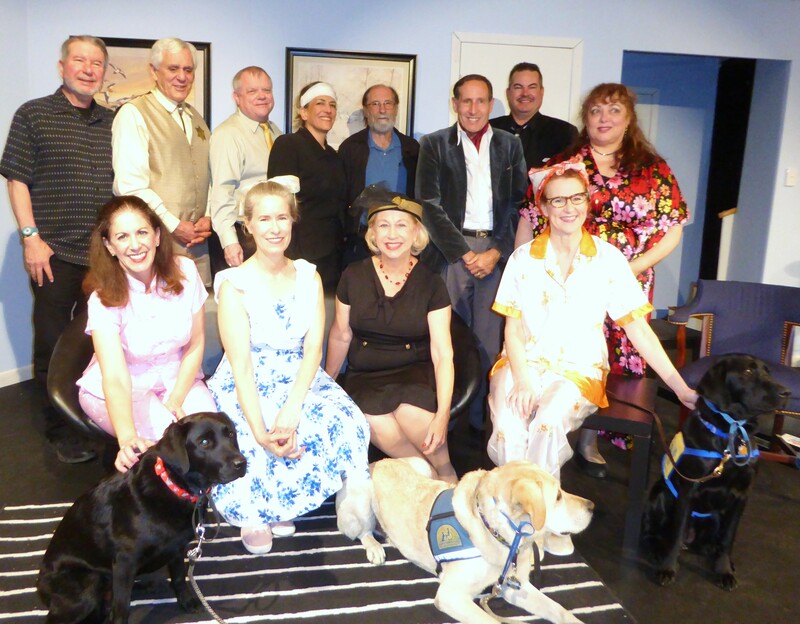 It was the first live, stage production for eleven dogs training to be companions through the CCI South Bay Chapter (www.cci.org). They mostly slept through all the antics and chewed on dog bones. The actors did, however, get a few barks during the last act when the lights were out. Playwright Fred Carmichael (1924–2009) directed Exit the Body for its debut in Vermont 57 years ago in 1961 — the same year that the non-profit Santa Clara Players was founded, followed by its first production in 1962. George Doeltz has been the show producer since 2009. Discover more about the Players and future productions at www.santaclaraplayers.org. 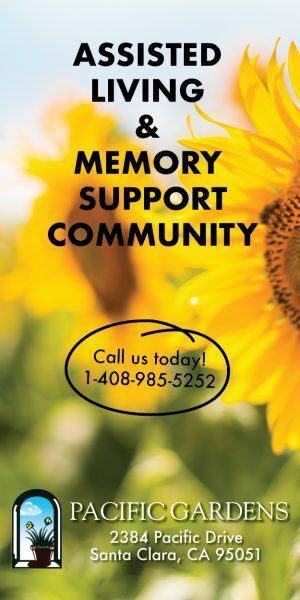 Call (408) 248-7993 for Exit the Body reservations. The 71-seat theater is located on Don Ave., on the grounds behind Santa Clara’s Triton Museum of Art, 1505 Warburton Ave.